Get ready to get awesome! 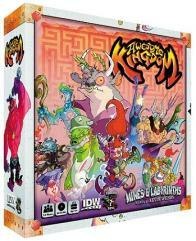 In Awesome Kingdom by Kevin Wilson (Descent, Arkham Horror, CHEW) you'll take charge of one of the "Awesome Ocho," a band of heroes on a dungeon crawl searching for untold riches. This tongue-in-cheek dungeon crawler delivers three rounds of highly strategic laughter in an over-the-top setting of awesome proportions!